This interactive map from the Washington Post is one part of a long-form piece that looks at NASA and the improbable tasks facing the agency. Specifically the piece looks at how NASA wants to get to Mars, but how difficult that is and how an also difficult asteroid mission is as a backup plan. Really fantastic is about all I can say. Credit for the piece goes to Joel Achenbach, Alberto Cuadra, Kennedy Elliott, Rebecca Rolfe, and Ricky Carioti. Last week NASA announced that last year, Voyager 1 left the Solar System about 25 August 2012. A lot of the graphics that were published to support that story chronicled the distance travelled by that probe. 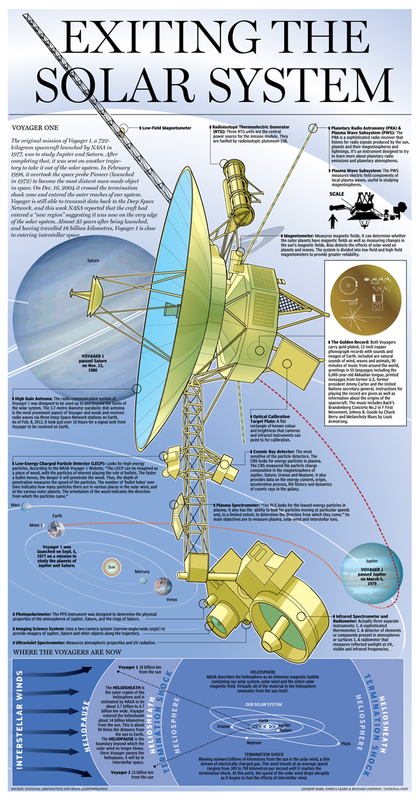 However, this excellent graphic by the Los Angeles Times instead looks at how NASA determined through the data returned that Voyager had left the Solar System. The piece does a really good job of setting up the story in illustrating the instrument packaged used to collect the data. Moving down the piece, it shows locations and the different environments and then how those environments differ in electron density. Lastly it looks at how NASA interpolated the date from the data collected. A really solid piece. Credit for the piece goes to Monte Morin, Doug Stevens, and Anthony Pesce. 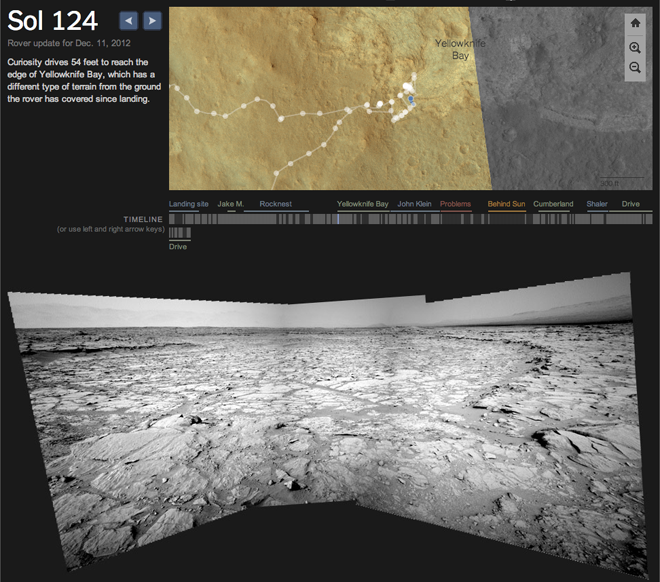 It’s an interactive piece from the New York Times that charts out just where the rover has driven and photographs of the stops along the way. There’s also a nice little chart that shows just how much of the trip has consisted of driving. Credit for the piece goes to Jonathan Corum and Jeremy White. 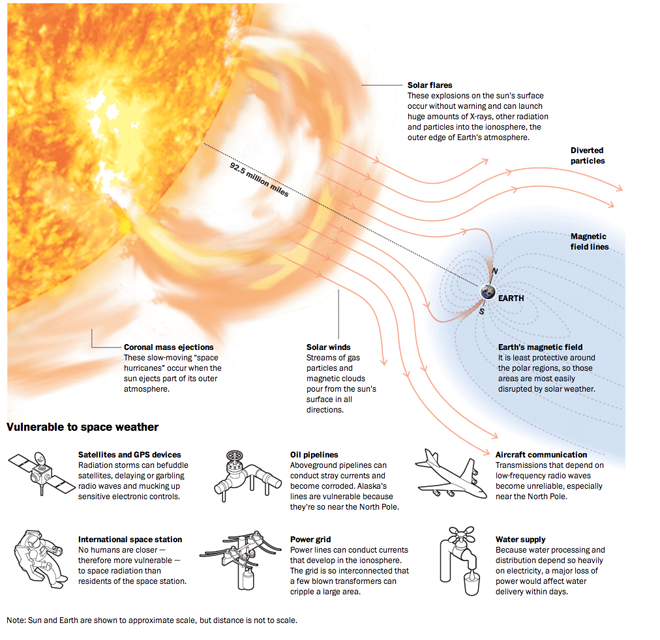 A few weeks ago the Washington Post published a graphic that explained how space weather can have significant impacts on Earth. This is more of an illustrated diagram and less of a data visualisation piece, but it still worth a read. Why? Because, if scientists are correct, the sun’s magnetic poles should soon finish a polarity reversal. And that creates the potential for some stormy space weather. Someday humanity will find a planet amongst the stars similar in temperament to Earth. 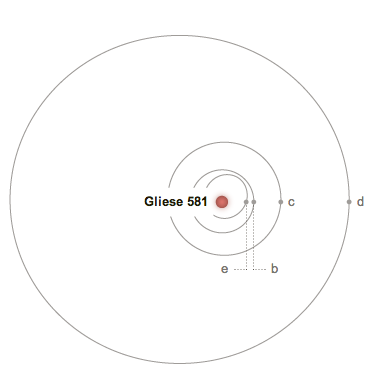 One of the best star systems to explore is Gliese 581, a small and faint star some 20 light years away. 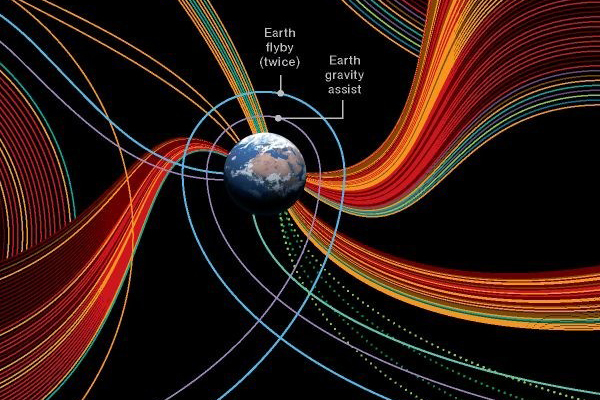 Calculations show that there are a few planets that could exist in or near what is often called the Goldilocks Zone. The Goldilocks Zone describes the distance from the systems’ star where planets could exist with liquid water. But generally, one needs to take that with a grain of salt. Here in the Sol System, for example, Earth is joined by Venus and Mars. But neither of those planets appear capable of sustaining life at least at present. The problem with Gliese 581 is that we are not yet certain as to exactly how many exoplanets form the planetary system. It might be four; it might be five. The different schools of thought lead to different conclusions about the possibility of there being liquid water. And life as we know it requires water. 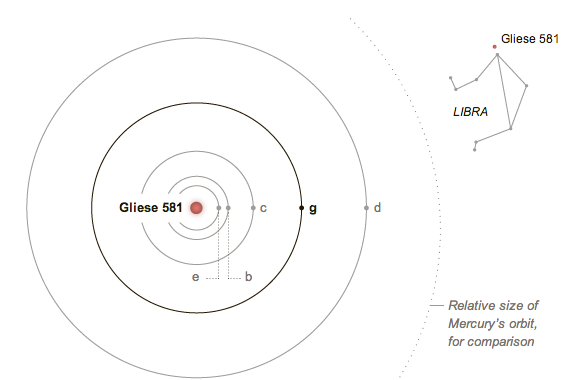 The New York Times looked at Gliese 581 earlier this summer and compared the two different orbital models. Space. Something About a Frontier? Today’s post comes via one of my co-workers. I don’t have any information on it other than it being an infographic looking at our exploration of the solar system (and in the near future beyond, thanks Voyager). My guess is that it isn’t particularly new, as I would imagine that the designer would have liked to have called out the Curiosity mission that just landed on Mars. But so far as I can tell, that mission is absent from the infographic. Author Brendan BarryPosted on 29 August 12 11 November 16 Categories InfographicTags diagram, illustration, infographic, information design, maps, science, space, technologyLeave a comment on Space. Something About a Frontier? Curiosity shall soon be exploring the surface of Mars seeking to understand the geological history of the planet. 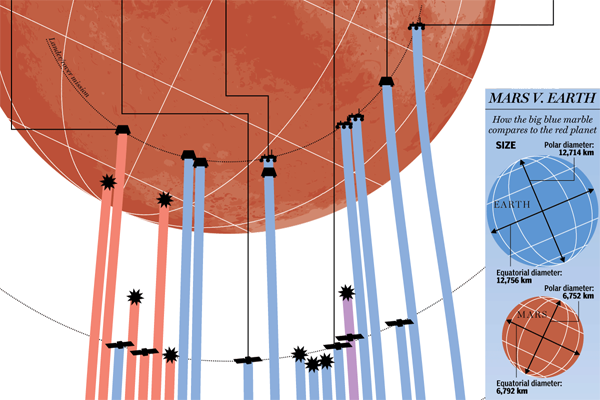 But in this infographic, see the cropping below, from the National Post we can see previous missions to Mars. We have not always been successful in operations in and around Mars, but our recent track record is much improved. Credit for the piece goes to Mike Faille. Sometimes an infographic needs to put us in our place. Humanity is but one of many species on one of many planets in one solar system. 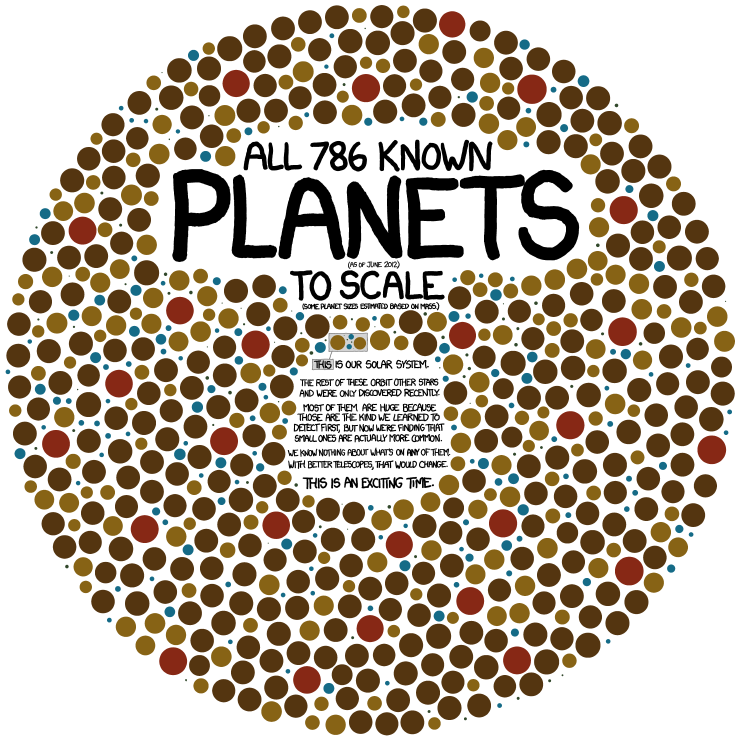 Over at xkcd, we can see how only now are we beginning to expand our knowledge of how many other solar systems and planets there are (and that are just waiting to be discovered). This is a post that goes back a little bit in time, but that I stumbled upon and found worth a post. Last summer the United States ended the Space Shuttle programme by retiring all of our orbiters. And of course this prompted many to attempt infographics about the history of bringing liberty and freedom to space. 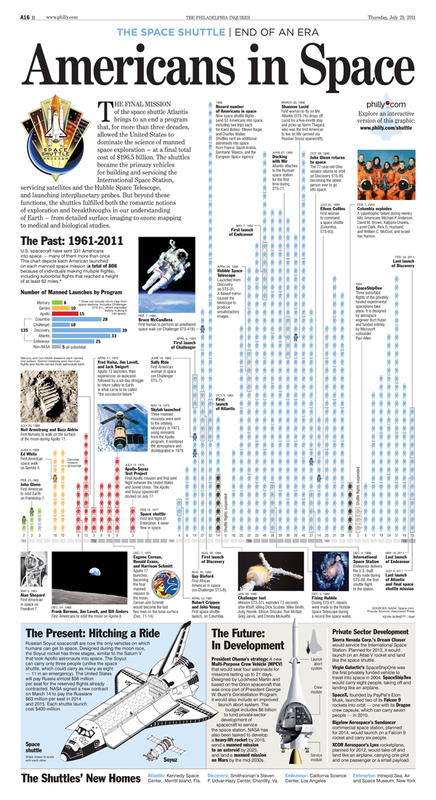 Amidst the fond farewells, I missed this interactive piece from the Philadelphia Inquirer about the history and the future of Americans in space. The interactive piece contains three separate sections. 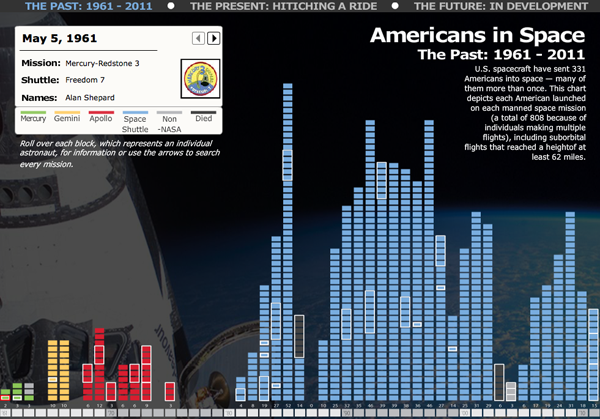 The first looks at the individual Americans who made it into space. The second compares the Space Shuttle to the Russian Soyuz craft that we now must use to get into space. The third looks at the future, and what we might use. But, the Inquirer also had a print edition to worry about, and published a static version of the piece. Is it perhaps a bit cluttered, yes, but the addition of the photographs and the annotations (even though the annotations are available as rollover conditions in the interactive piece) makes the print version more welcoming to explore and read at leisure. Additionally, the difference in scale of the three segments of the piece give a clear importance to the individuals rather than to the technology. This distinction is lost in the interactive piece because each segment is the same size and receives the same scale of treatment. Credit for the interactive piece goes to Kevin Burkett and Rob Kandel. Credit for the print piece goes to Kevin Burkett.